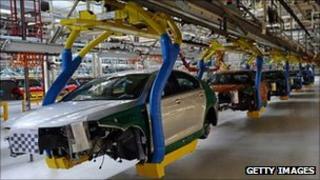 UK manufacturing output shrank in August, led by a sharp decline in export orders, a survey suggests. The Markit/Cips manufacturing purchasing managers' index (PMI) fell to 49 last month - a 26-month low. Any level below 50 implies contraction. It is based on a survey of purchasing executives at over 600 firms. New export business, which drove the recent manufacturing recovery, fell at its fastest rate since May 2009. New orders and employment also fell. Export demand had been growing at close to record levels as recently as December, according to past surveys. August also saw the sharpest fall in new orders for the sector in two-and-a-half years, and the first drop in output since 2009. "All in all, then, the CIPS survey highlights the increasing risk that the industrial sector - and perhaps even the overall economy - is heading for a double-dip," said Samuel Tombs, economist at Capital Economics. He noted that the data suggested manufacturing employment had begun to contract, "suggesting that the labour market is starting to be affected by the slowdown in the broader economy". The UK data mirrored a slowdown evident in PMI surveys for other major manufacturing countries worldwide, released on the same day. Manufacturing activity in China continued to slow, albeit at a slower pace, while the eurozone also dipped into contraction in August. "The second half of 2011 has so far seen the UK manufacturing sector, once the pivotal cog in the economic recovery, switch into reverse gear," said Rob Dobson, senior economist at Markit, who produce the survey on behalf of the Chartered Institute of Purchasing and Supply (Cips). "The sudden and substantial drop in new export orders is particularly worrisome, with UK manufacturers hit by rising global economic uncertainty, just as austerity measures are ramping up at home. "As consumer and business confidence are slumping both at home and abroad, it is hard to see where any near-term improvement in demand will spring from." Manufacturers focused on the finished consumer goods section did see a sharp upturn in output, although Markit said this appeared to be related to stock-rebuilding and is therefore unlikely to be sustained. One positive note in the survey was a slowdown in input costs, to their slowest rate of increase in 20 months, which may increase the pressure on the Bank of England to engage in further monetary expansion. "The survey not only reinforces belief that the Bank of England may very well keep interest rate down at 0.5% into 2013 but also fuels expectations that the bank may eventually turn to more quantitative easing," said Howard Archer, economist at IHS Global Insight.